I probably don’t know about your latest job project. I don’t know what your kids are up to. I don’t know about that vacation you’ve got coming up. I can’t say what city you’re visiting for business. I have no idea that you’re having a bad day. But I do know you’ve got a really strong take about where social software helps companies. Why? Because that’s an area where we have a common interest. I don’t need to know all of you, as Dunbar’s Number posits. I only need to know part of you. Dunbar’s number is a theoretical cognitive limit to the number of people with whom one can maintain stable social relationships. These are relationships in which an individual knows who each person is, and how each person relates to every other person. This is a recurring issue in social networks. As in, why do people maintain large numbers of connections that can’t possibly be personal? I like to break it people down into three types. Close Friends: These folks view social networks as sites for staying up to date on a limited set of close connections. As in, “actual” friends. Information Seekers: These folks, including me, expand beyond those with whom they have a pre-existing connection. Their interest is a bit of networking, and tapping information in their field. Power Networkers: These folks amass thousands of connections. In the offline world, they’d have huge rolodexes. They want to connect with as many people as possible. Connections are fundamental to their professions. Think Chris Brogan and Robert Scoble. The Close Friends users really want just that…updates from and interactions with their actual offline connections. When they post an update, they’ll hear from someone they know. When they read an update, it will be from someone they know. This is what Dunbar’s Number is all about. We Have Dunbar’s Number…How about Scoble’s Number? 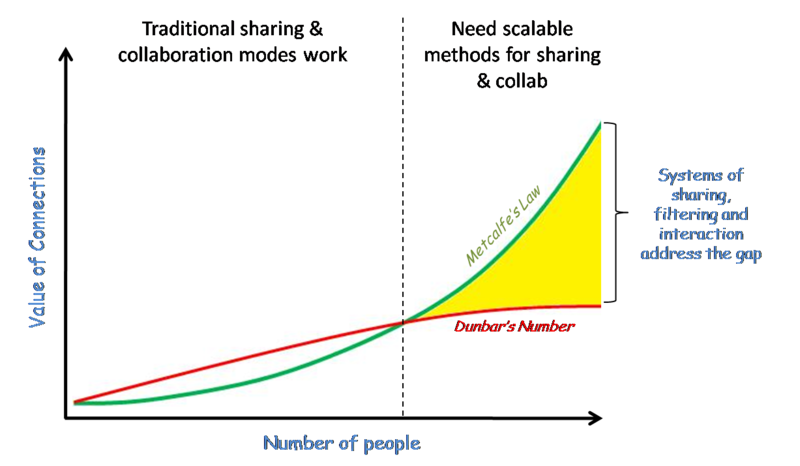 If Dunbar’s Number is defined at 150 connections, perhaps we can term the looser connection of thousands as Scoble’s Number. The next model of social connections. Now let me explain what I’m saying here. I’m not saying we can magically follow thousands of people closely because of social media. We can’t. I’m not saying that we won’t have close connections that we know much more about. We will. I am saying that a significant percentage of our online interactions will be with people about whom we know little. That last point occurs as your connections get larger and larger. I follow 1,600 people on FriendFeed, 1,100 on Twitter. I can say from experience now that I know little about many of the people with whom I have @reply and thread conversations. And it doesn’t bother me. I get plenty of value from these drive-by interactions. In the top graph for Dunbar’s Number, you’re aware of a fuller range of what’s happening in someone’s life. Even if you aren’t actively trying to know about it. This is the stuff of warm friendships. You internalize a lot more information about someone, and they know a lot more about you. You develop short-hand ways of talking, and can call on older experiences to relate to new information and developments. Scoble’s Number is a our new reality. By maintaining a larger number of weaker connections, you can tap a wider range of opinions. People often deride “echo chamber” aspects of social media. Well, if you’re only paying attention to same people over and over, you will have created your own personal echo chamber. This is not to say that we don’t have a more limited set of people we trust as information filters. 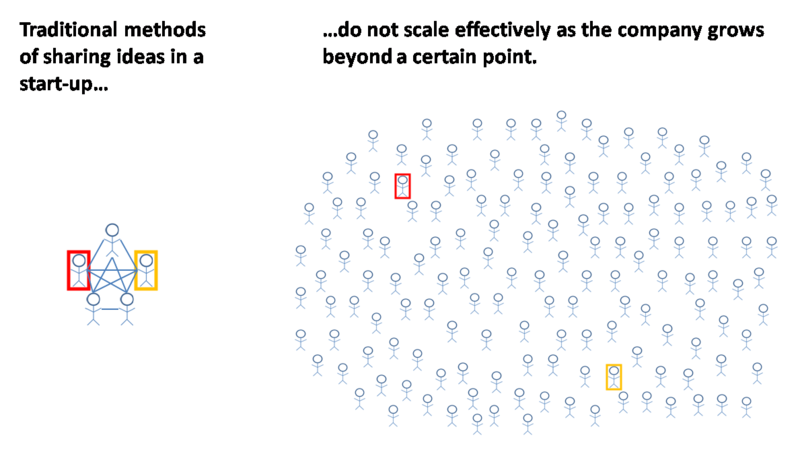 Those people are important for keeping on top of things in a more systematic way. But I tend to think of Scoble’s Number as a rich, chaotic frenzy of interactions that never would have occurred before social media was adopted so heavily. Online bulletin boards have this aspect, in that you “followed” thousands of participants on them. Think of molecules bouncing around, with occasional collisions. It’s these collisions where interesting reactions occur. Where you learn things you didn’t know, and you get perspective from people beyond your immediate circle. It’s healthy. And given the growing participation in social media, and the low friction for finding and interacting with others, I see the trend as favoring Scoble’s Number. Over time, some connections will move from being out there in your Scoble’s Number into your more personal Dunbar’s Number.